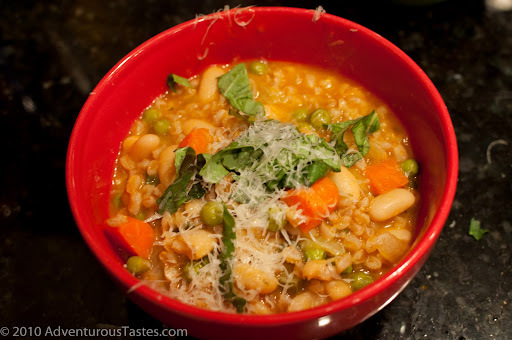 I was looking for an excuse to use my giant bag o' Costco farro again, and I stumbled on two different recipes for a farro and bean soup similar to a dish popular in Lucca, Italy. I took a bit of the best from each recipe to whip up my own personal version. This soup was easy to make and chock full of flavorful and healthy ingredients. It was hearty and filling enough to quiet even the most avid carnivore, and made a perfect dinner when paired with a light arugula salad.